A major study of British Columbia’s anti-pesticide by-laws has concluded that municipal prohibitions are DISMAL FAILURES. This is because municipal officials are now circumventing their own prohibitions by taking advantage of EXCEPTION STATUSES that they have conveniently inserted in their by-laws. 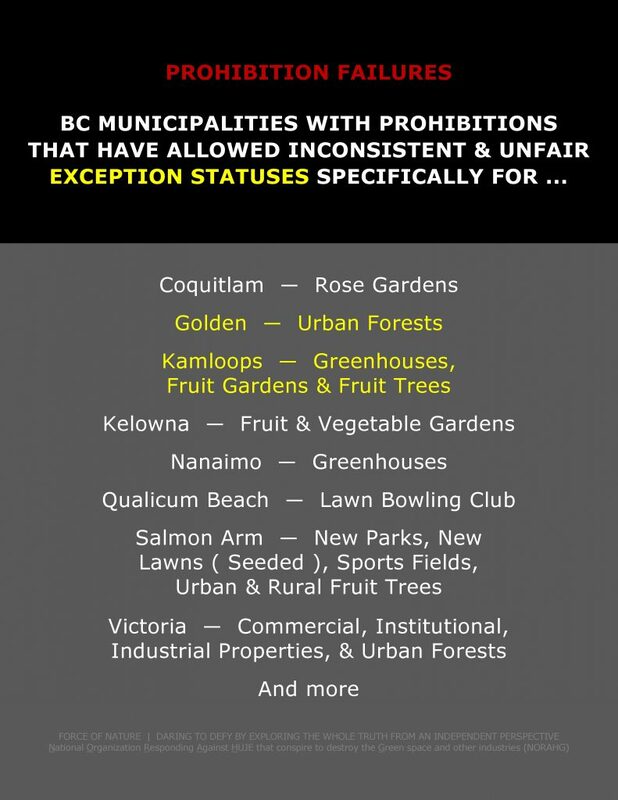 Municipal prohibitions have provided inconsistent & unfair EXCEPTION STATUSES for invasive weeds & destructive insects ― for municipal properties and even residential homes ― but NOT for lawn care businesses. Consequently, municipal prohibitions have annihilated legitimate & tax-paying businesses that operate in the professional lawn care industry. These businesses CANNOT afford the hardship & the cost of this #@! !% prohibition nonsense. 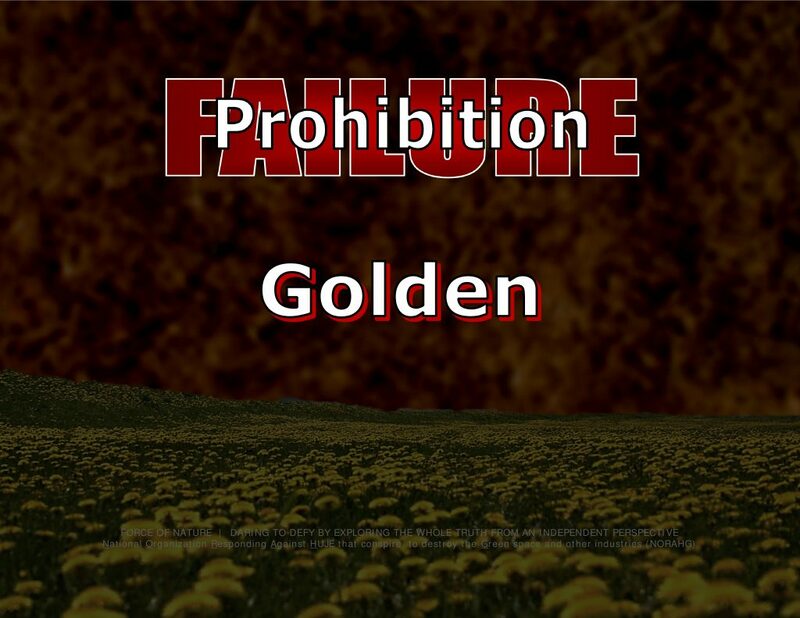 Once any prohibition is adopted, local businesses are expected to disappear into oblivion within 2 or 3 years, and vast numbers of workers are expected to become unemployed. Additionally, for those residents with the same pest problems on their home properties, they may be shжt-outta-luck relying on ANY exception. Without conventional pest control products, home properties have become pest-infested and dangerous garbage dumps because it is impossible to control invasive weeds and destructive insects by using so-called green alternative pesticides & practices. Municipal prohibitions have led to catastrophic pest carnage for tens of thousands of destroyed and ravaged properties every single year. 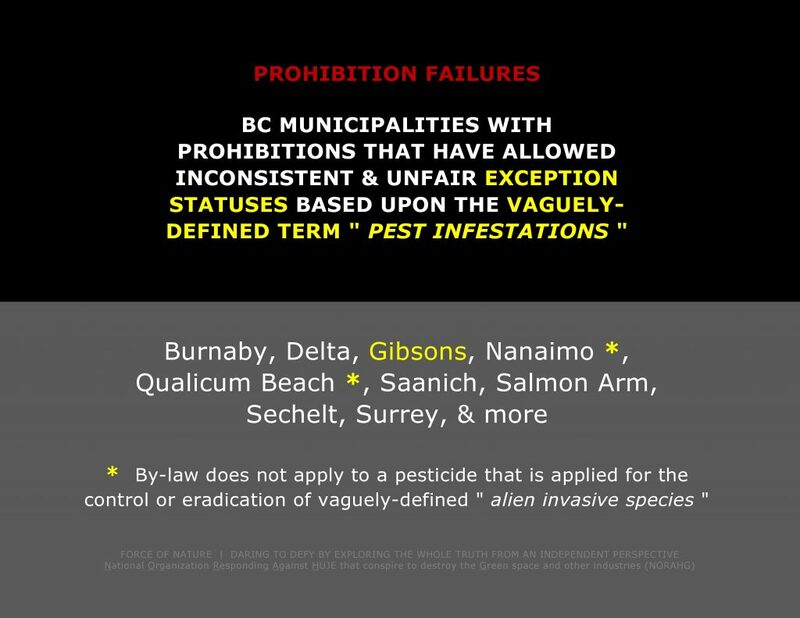 British Columbia’s municipal EXCEPTION STATUSES represent the best examples of the failures, the ridiculousness, and the destructiveness of their anti-pesticide prohibitions. Municipal prohibitions have been disgustingly arbitrary in their flagrant discrimination against professional lawn care businesses and home properties ! In order to be consistent & fair, there should be NO #@! !% EXCEPTION STATUSES whatsoever ! The results of this major study of British Columbia’s anti-pesticide by-laws now includes … Gibsons, Golden, and Kamloops. 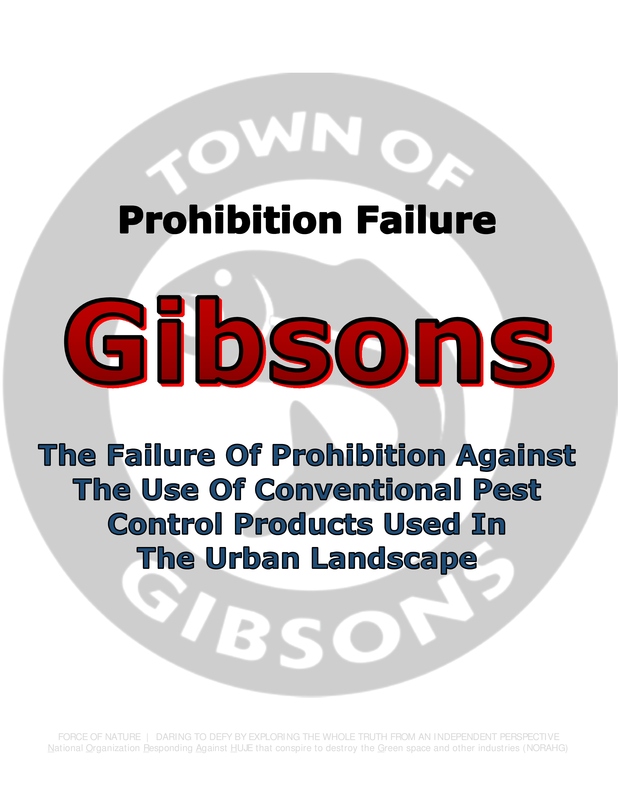 On April 19th, 2005, the town of Gibsons legislated & imposed its reckless & arbitrary prohibition by-law against conventional pest control products used in the urban landscape. Gibsons is a coastal community located in south-western British Columbia, with a population of less than 5000. See later segment entitled « PRECAUTIONARY PRINCIPLE ». … the presence of pests in numbers or under conditions that involve an immediate or potential risk of substantial loss or damage [ on town-owned properties only ?!?! ]. Clearly, this EXCEPTION STATUS has been designed to allow the use of conventional insecticides on town-owned green spaces, on trees that are INFESTED with Gypsy Moth Insects, which must be controlled annually. Gypsy Moth Insects are uncontrolled insect pests that require EXCEPTION STATUSES for municipal properties. Without these EXCEPTIONS, the town will be inflicted with catastrophic ecological insect carnage. Furthermore, any pest INFESTATION on private property would be arbitrarily & politically defined in the harshest manner possible by Gibsons’ town staff. Unfortunately, residents are shжt-outta-luck with protecting their private properties. Gibsons’ pesticide-hating officials will NEVER agree to allow the annual application of conventional insecticides for the control of INFESTATION of ANY destructive insects like Gypsy Moth. 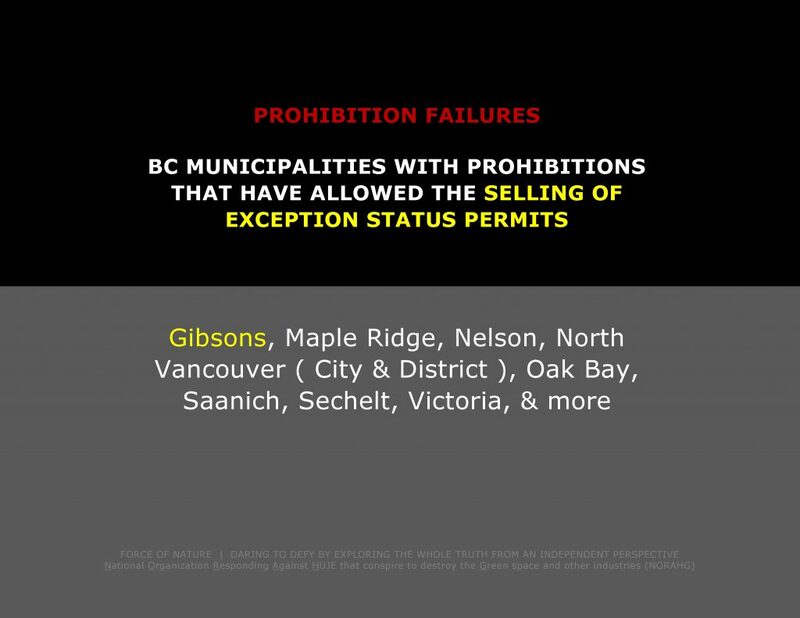 This EXCEPTION demonstrates Gibsons’ councillors’ audacity & hypocrisy in providing a PERMIT. … controlling or destroying INSECTS which have INFESTED property [ on town-owned properties only ?!?! ]. In other words, town staff have been allowing pest control applications WHEN IT ARBITRARILY SUITS THEM ! Upon application to the Town in the prescribed form ( Schedule B ) and the payment of any fee by a property owner or a tenant, the Town may issue a permit for the application of a Pesticide. 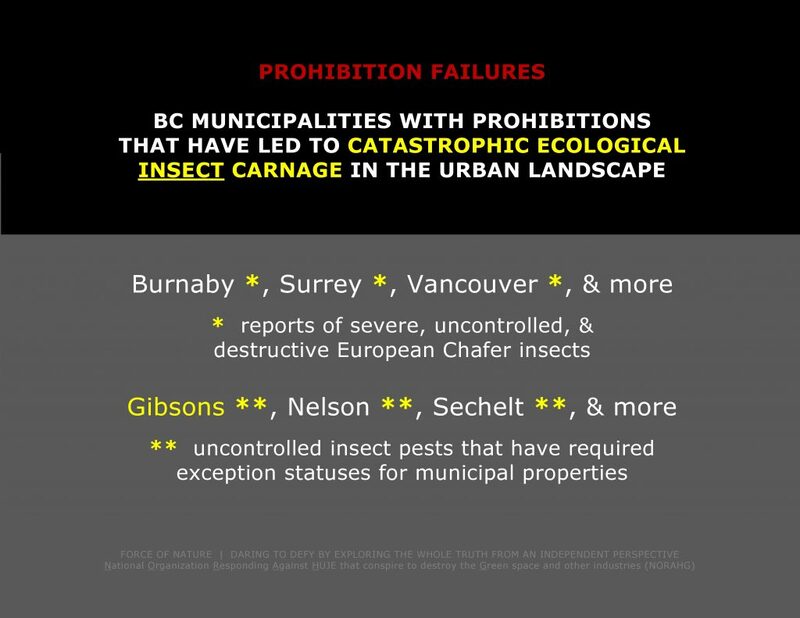 Gibsons’ by-law maliciously prevents home-owners from taking care of damaging pests on their properties without first extorting the purchase of 50-dollar PREDATORY-PERMITS for every single pest control treatment on residential properties. 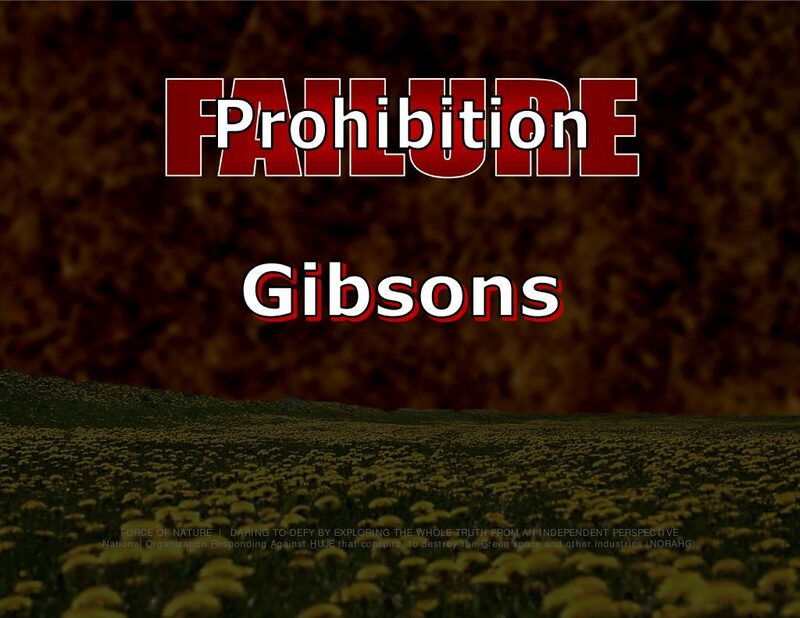 In essence, Gibsons has granted itself the power to legally extort untold thousands of dollars in unjustified profits from the sale of PREDATORY-PERMITS. In essence, these loathsome municipalities have despicably conspired to impose prohibition against conventional pest control products with the intention of PROFITING from the sale of PREDATORY-PERMITS. Who can afford this #@! !% nonsense ?!?! There should be NO #@! !% PREDATORY-PERMITS ! The PRECAUTIONARY PRINCIPLE is absolutist, misused, vacuous, and is simply another malicious weapon of coercion and ultimate terrжr concocted by pesticide-hating fanatжcs. The PRECAUTIONARY PRINCIPLE has been DISCREDITED by true experts like Dr Keith Ross Solomon. Landscape and garden use of pest control products DOES NOT qualify for consideration under the PRECAUTIONARY PRINCIPLE. They are NOT serious, they are selective to pests, have low toxicity to non-target organisms, and are well understood. The effects of these pest control products are NOT irreversible. There is rapid recovery through re-invasion and weed seeds and most need to be used at least once per season. 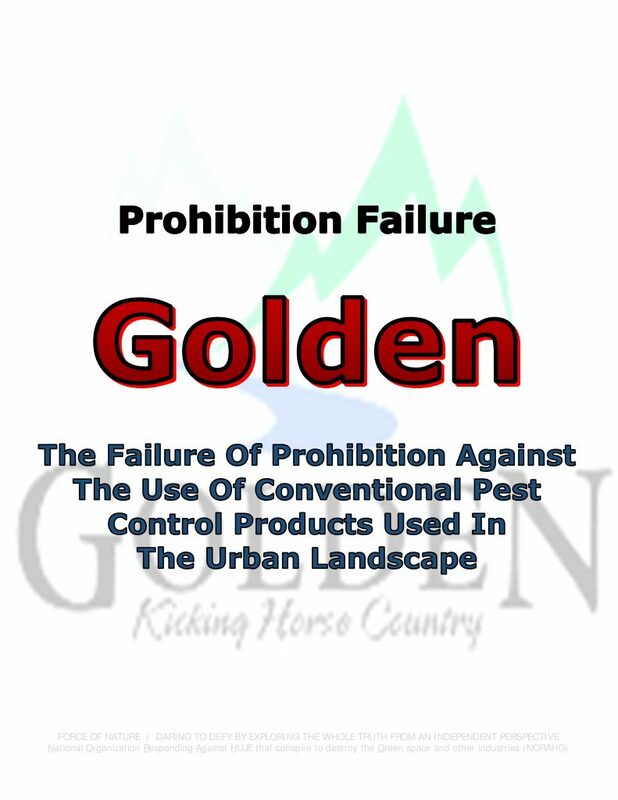 On October 5th, 2010, town of Golden legislated & imposed its reckless & arbitrary prohibition against conventional pest control products used on town-owned green spaces. In the following year, this fanatical & unnecessary life-style choice was also imposed against residential properties beginning April 1st, 2011. Golden is a town in south-eastern British Columbia, located between Calgary, Alberta, and Vancouver, with a population of less than 4000. An EXCEPTION STATUS has been provided by Golden to « address an economic or environmental threat to URBAN FORESTS ». This exception demonstrates Golden’s councillors’ contradictions & hypocrisy by implying that pest control products are safe to use on urban forests, and yet, the very same products are somehow unsafe when used on residential properties. Clearly, this EXCEPTION STATUS has been designed to allow the use of conventional insecticides on town-owned green spaces, like trees that are INFESTED with Gypsy Moth Insects, which must be controlled annually. Furthermore, any pest INFESTATION on private property would be arbitrarily & politically defined in the harshest manner possible by Golden’s town staff. Golden’s pesticide-hating officials will NEVER agree to allow the annual application of conventional insecticides for the control of INFESTATION of ANY destructive insects like Gypsy Moth ! Golden’s provision for this EXCEPTION STATUS represents the best example of the failure & the ridiculousness of its fanatжcal-prohibition. Town councillors have been allowing pest control applications WHEN IT ARBITRARILY SUITS THEM ! … built structures and amenities on public land including, but not limited to, roads, curbs, gutters, sidewalks, retaining walls, dykes, foundations, outdoor playing surfaces, parking lots, and gathering areas. … DOES NOT apply to the use or application of a pesticide … used to protect PUBLIC INFRA-STRUCTURE. This is inconsistent & unfair ! Golden’s councillors have been allowing pest control applications WHEN IT ARBITRARILY SUITS THEM ! … if it is safe for children and adults to walk and play on or near herbicide-treated public infra-structures, then why is it not safe for them to walk and play on herbicide-treated lawns ?!?! There should be NO #@! !% exception statuses whatsoever ! 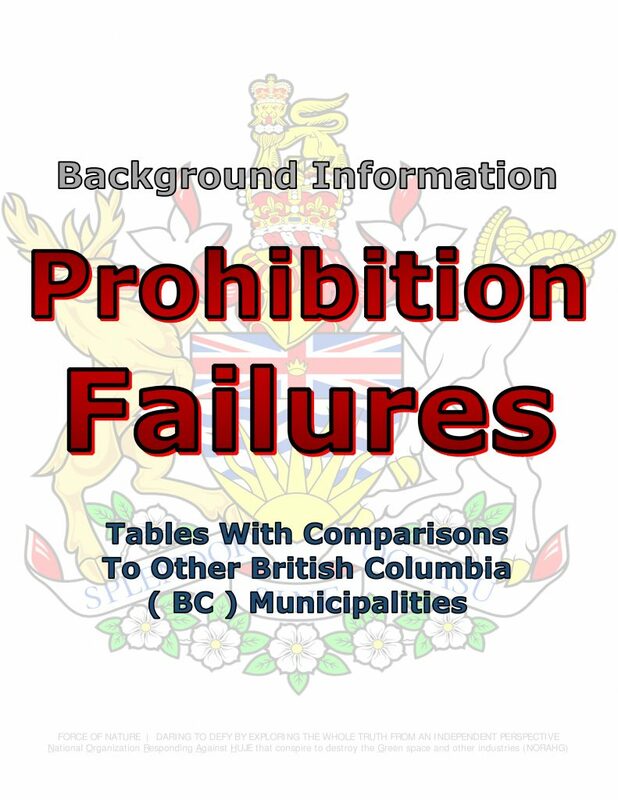 Since January 19th, 2016, the city of Kamloops has arbitrarily imposed fanatical-prohibition against « NON-ESSENTIAL » [ ?!?! ] conventional pest control products used by businesses operating in the professional lawn care industry. 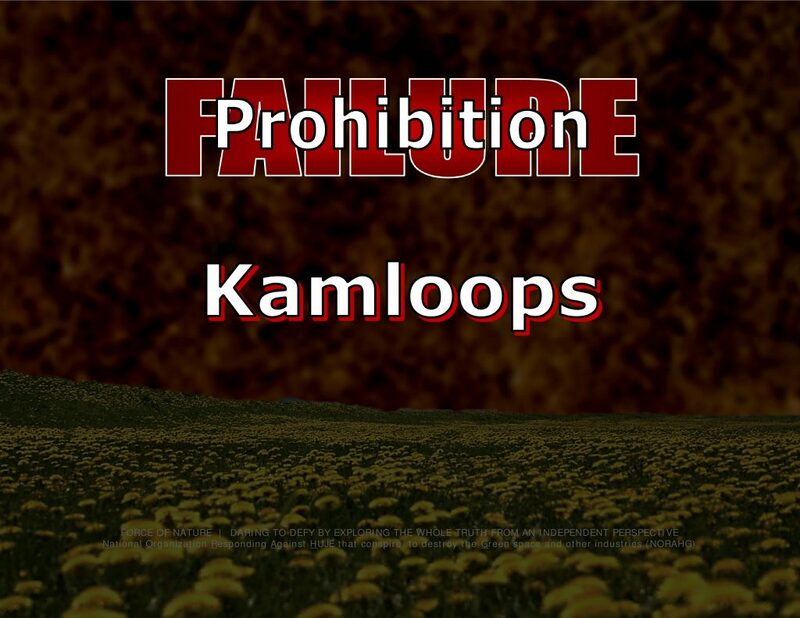 Several years earlier, since July 28th, 2009, Kamloops had also self-imposed prohibition for all of its city-owned green spaces like parks and sports facilities. Kamloops is a city in south-central British Columbia, with a population of over 90,000. Not surprisingly, city councillors quickly recognized that green alternative pesticides & practices are DISMAL FAILURES not only because of their STUNNING COSTS but also because of their INEFFECTIVENESS. In addition, the report said $25,000 would also be needed for educational purposes ( i.e. brain-washing propaganda ) for the public, including interpretive signage and workshops. Observers expect that these EXORBITANT & COSTLY EXPENDITURES will be repeated on an annual basis, in perpetuity. 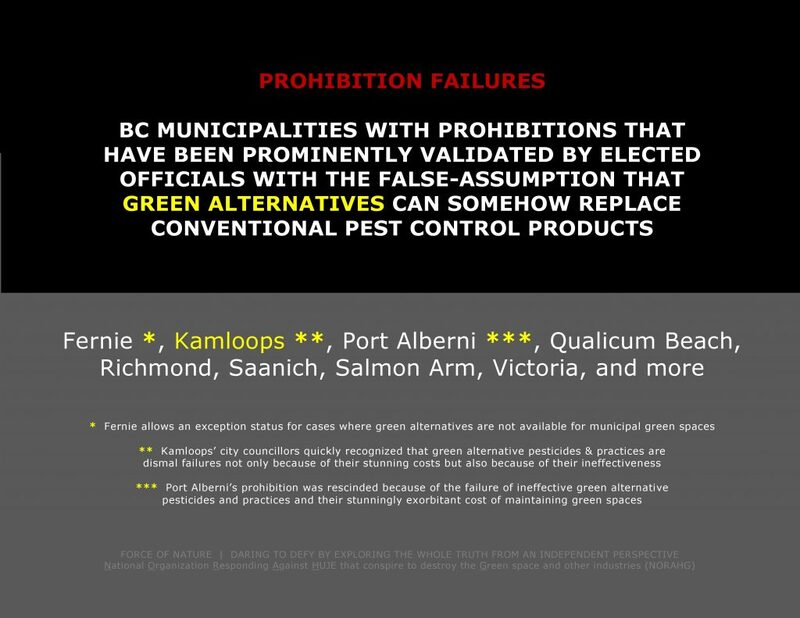 Kamloops’ elected officials have maliciously & recklessly imposed arbitrary & unnecessary prohibition against pest control products that are desperately needed by local businesses operating in the professional lawn care industry. They have imposed SPECIFICALLY-DISCRIMINANT prohibition against these businesses, and ONLY these businesses. 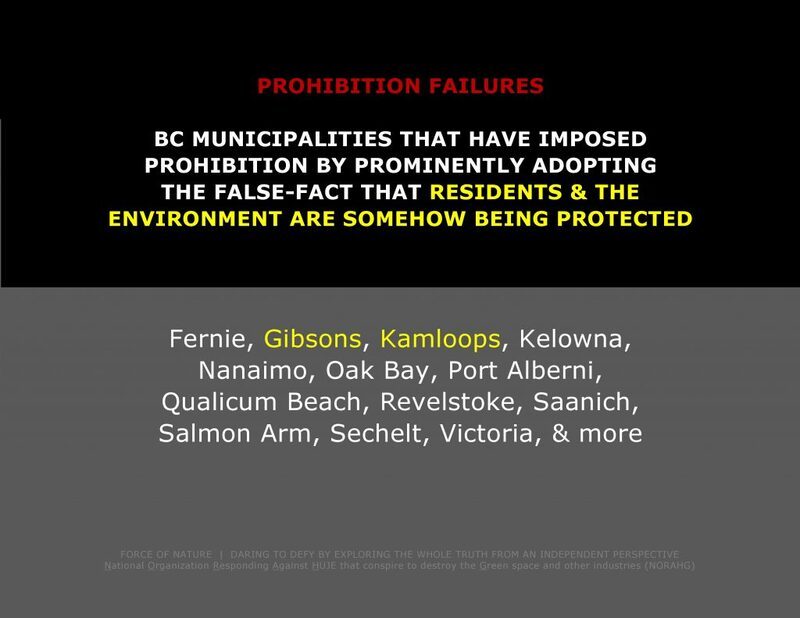 Because of Kamloops’ discriminatory anti-pesticide assault by its fanatжcal officials, these businesses will be mercilessly destroyed by a carnage of unemployment, bankruptcy, business failure, homelessness, terrжr, despair, & destitution. 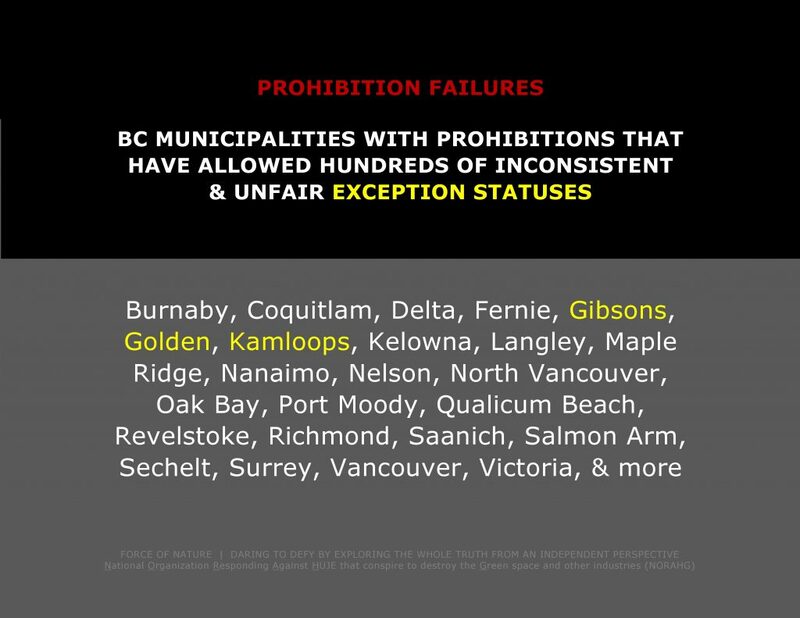 Why have Kamloops’ elected officials sadistically & prejudicially attacked these businesses ?!?! Because they have operated as the subservient lap-dogs of contemptible & radical organizations like Green Party, Canadian Cancer Society, and New Democratic Party. These organizations are listed among the nation’s prominent anti-pesticide organizations. Consequently, the owners, employees, and families dependent on professional lawn care businesses face, and will continue to face, terrжr, despair, and destitution, because of Kamloops’ fanatжcal officials. Kamloops’ residents object to personal life-styles being dictated by lap-dog-elected officials who receive fanatжcal instructions from radical organizations. 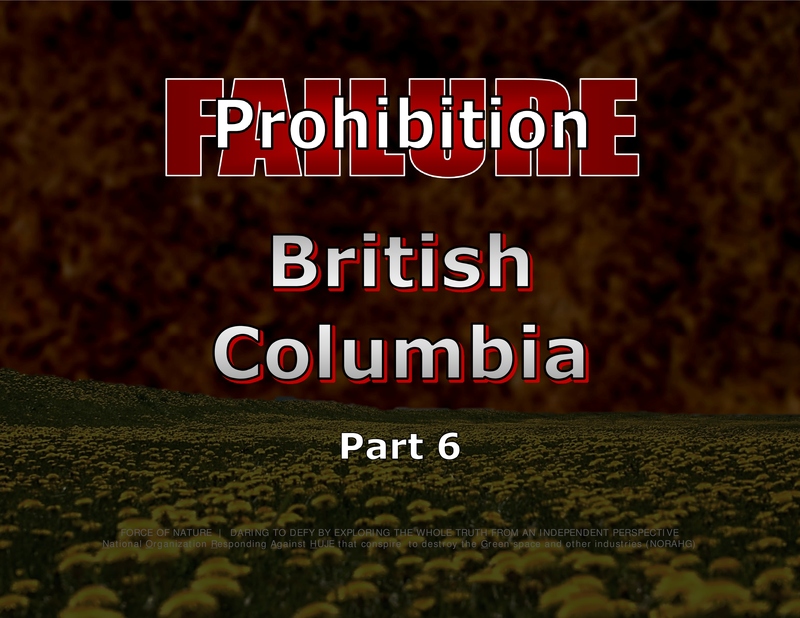 In jurisdictions outside of Kamloops, fanatжcal-prohibitions have already inflicted catastrophic carnage for businesses operating in the professional lawn care industry. 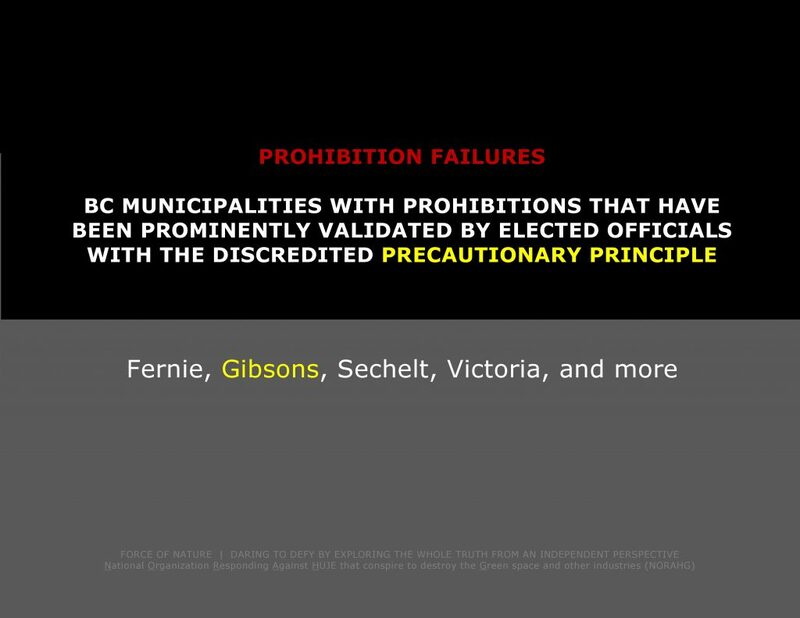 Fanatжcal-prohibitions have inflicted CATASTROPHIC CARNAGE in jurisdictions such as Halifax Regional Municipality, and the provinces of Quebec and Ontario. Because of a fanatжcal-prohibition in Halifax Regional Municipality, professional lawn care customers DISINTEGRATED by over 50 per cent. In British Columbia, as a direct result of municipal prohibitions, professional lawn care businesses have LOST over 40 per cent of their customers. As a sad consequence of fanatжcal-prohibition in the province of Quebec, over 60 per cent of the professional lawn care businesses were ANNIHILATED. Because of a fanatical-prohibition in Ontario, the professional lawn care industry LOST over 500,000,000 dollars, with over to 12,500 unemployed. Because of fanatжcal-prohibition, an overwhelming number of these businesses DISAPPEAR INTO OBLIVION within 2 or 3 years after legislation. Because of fanatжcal-prohibition, vast numbers of professional workers become UNEMPLOYED. 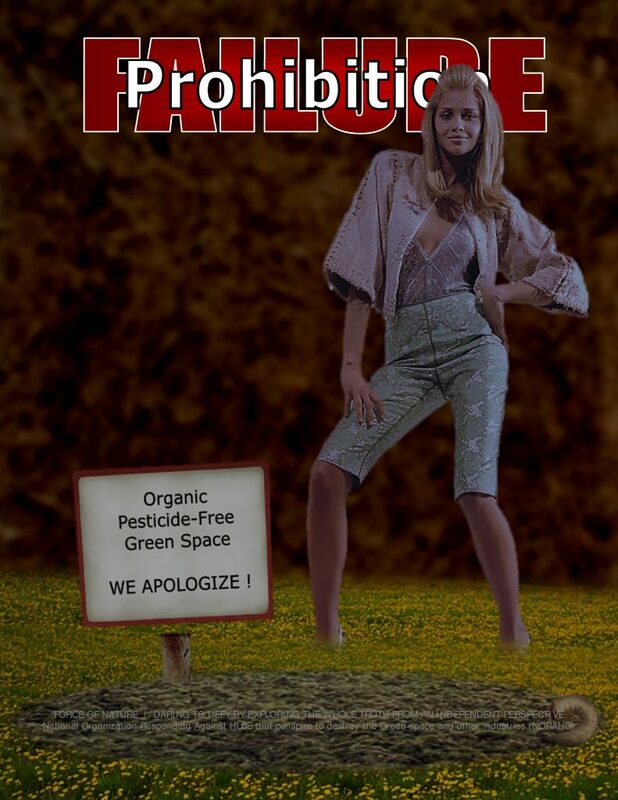 Because of fanatжcal-prohibition, the owners, employees, and families dependent on professional lawn care businesses have faced terrжr, despair, and destitution. Residential Home-Owners With Exception Statuses ?!?! Incredibly, do-it-yourself residential HOME-OWNERS in Kamloops have been allowed to continue using conventional pest control products, and yet, certified professional applicators ( i.e. professional lawn care businesses ) are prohibited from using the very same types of products. More specifically, HOME-OWNERS have been allowed to apply conventional pest control products on fruit gardens & fruit trees. Observers contend that prohibition must apply to EVERYONE. In order to be consistent & fair, there should be NO ARBITRARY EXCEPTION STATUSES for anyone. 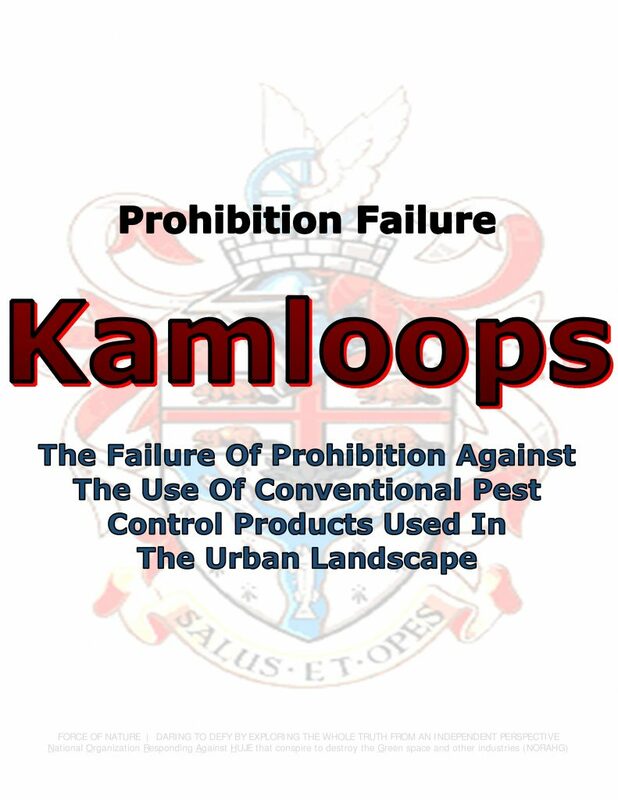 In fact, Kamloops’ officials must PROHIBIT ALL PEST CONTROL PRODUCTS from EVERYONE, including fruit & vegetable production, golf facilities, mosquito control, nursery production, orchards, rose gardens, sod production, and sports fields. 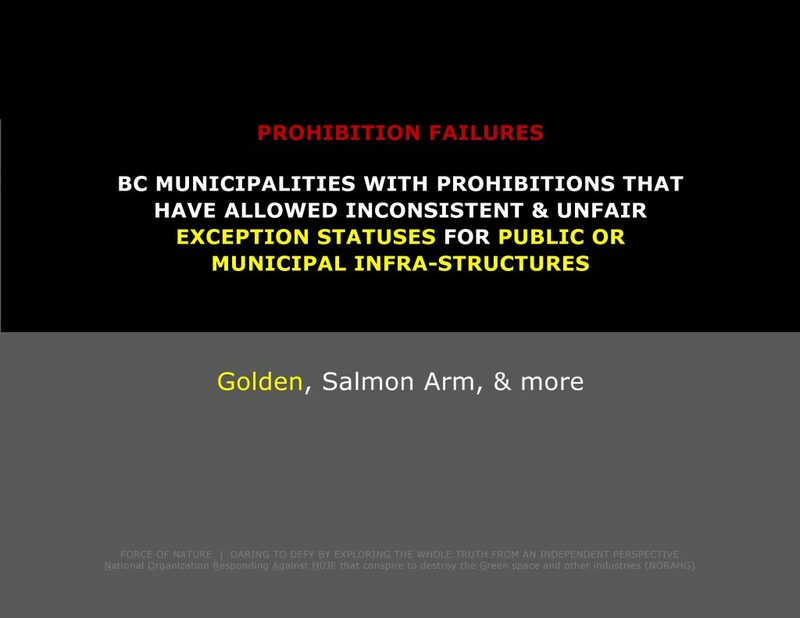 √ FACT — Municipalities Cannot Afford This #@! !% Ban Nonsense ?!?! Pesticide-free maintenance practices ( a.k.a. organic ) are stunningly expensive and not economically viable. 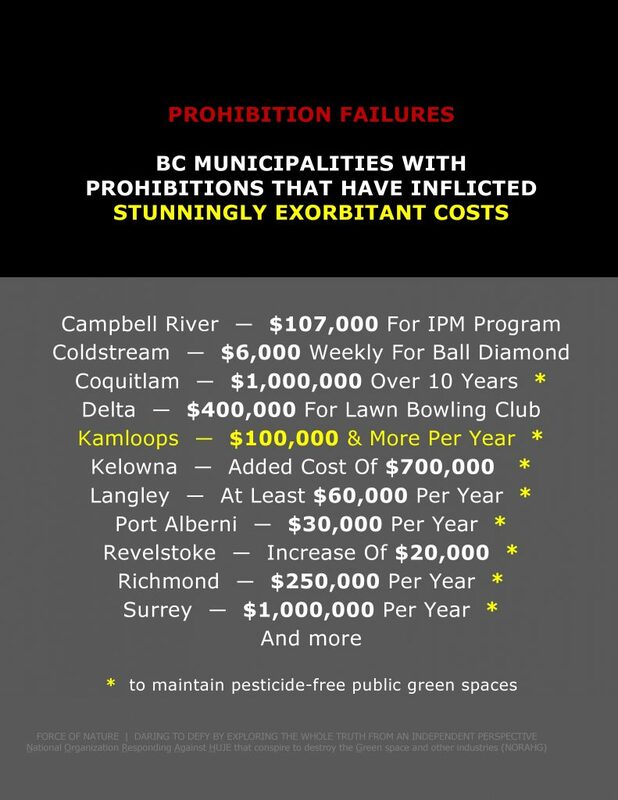 Anti-pesticide prohibitions have created catastrophic pest problems that have invaded city-owned & residential properties, have inflicted garbage dump green spaces, and have cost stunningly exorbitant amounts of money ! These problems have come as no surprise to observers who have repeatedly warned that it is impossible to keep from becoming pest-infested & dangerous garbage dumps unless conventional pest control products are allowed. The stunningly exorbitant costs of pesticide-free ( a.k.a. organic ) maintenance practices are due to factors such as green alternative pesticides, manual labour for weed-picking, and re-construction. 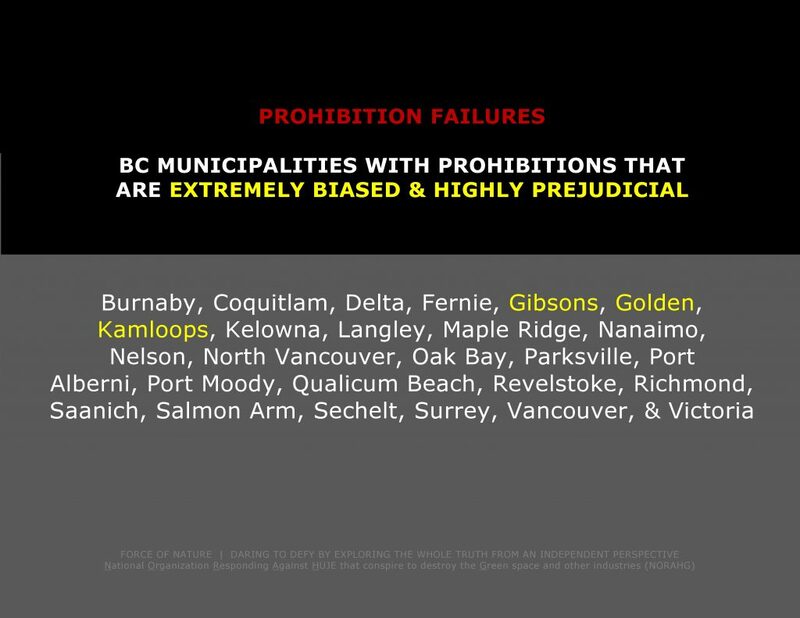 No one living in prohibition jurisdictions wants to live in #@! !% weed-infested, insect-damaged, and expensive garbage dumps ! 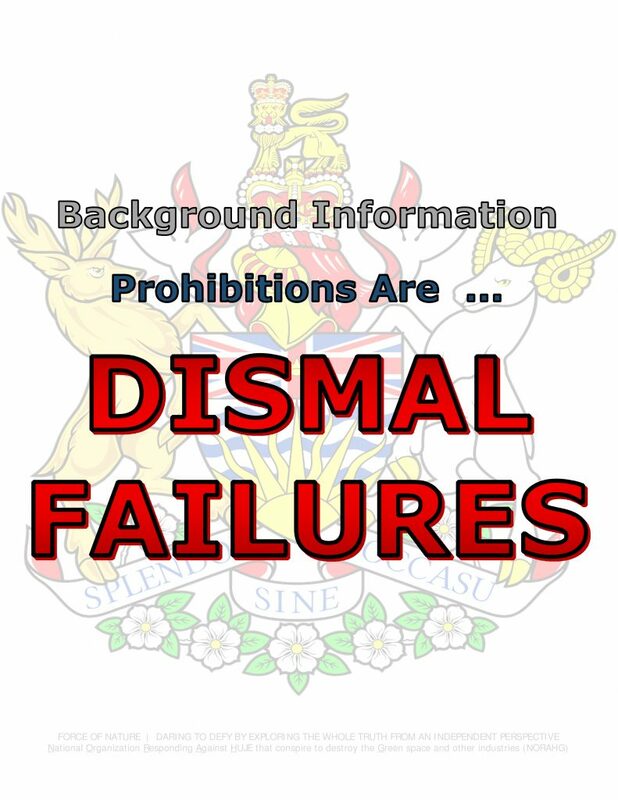 Consequently, prohibition has been a dismal failure for jurisdictions throughout North America ! Who can afford this #@! !% ban nonsense ?!?! Why does anyone listen to pesticide-hating fanatжcs ?!?! Pesticide-free maintenance practices ( a.k.a. organic ), proposed by these fanatжcs, are stunningly expensive due to factors such as green alternative pesticides, manual labour for weed-picking, and re-construction. Who can afford this #@! !% organic nonsense ?!?! There are NO economical, NO viable, NO efficacious, and NO low-risk alternatives to replace conventional pest control products. Green alternative pesticides are bogus and dismal failures ― they DO NOT WORK. By definition, alternatives are inferior, which is why they did not win the market-place originally. And, they are stunningly expensive. Who can afford this #@! !% alternative nonsense ?!?! 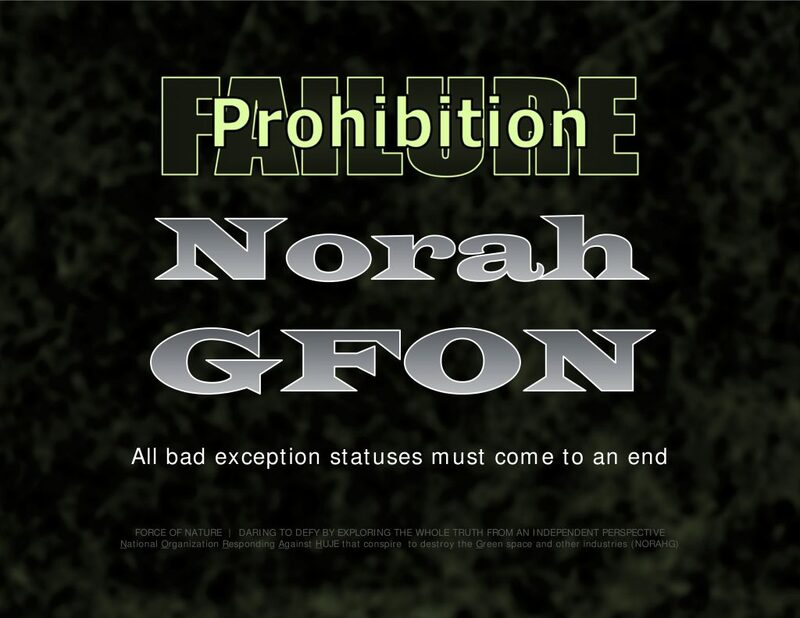 WE SPEAK THE WHOLE TRUTH ABOUT PROHIBITIONS FROM AN INDEPENDENT PERSPECTIVE !